Should I test my Pond Water? It’s always a good idea to have a pond water test kit on hand in case you suspect a problem with water quality. Tests are only usually necessary in mature ponds if there is a problem, but they can also be performed every 6-12 months for maximum peace of mind. Pond water test kits are a great way to quickly identify an imbalance that could be causing problems with your eco-system. Fish which have become sick, discoloured water, or unpleasant water odors, are all possible indicators of an imbalance occurring that a water test kit may help identity. Test kits may not be able to solve the problem by themselves, but they can accurately point you in the right direction of a possible solution based on the results. Sometimes, however, there are no signs of a problem and we’re simply curious about the results! Knowing for certain that the hard work you’ve put into your pond is reflected by great water quality is always a welcome pat on the back. Testing pond water and learning about each result is also a great way for beginners to learn more about what makes contributes to healthy pond water. Whatever your reason for testing, be it a new pond, a suspected problem, or just curiosity, there are several water test kits available to help provide the best results. Some test kits will only provide certain values, such as ammonia levels, whereas others will also give you indicators such as water kH and pH. If you’re sure the problem is ammonia spikes, you can be safe with a test kit that just tests for ammonia. If you’re not sure and want a full spectrum of results, you may need to purchase a few different kits or an “all-in-one” solution if one is available to you. Accuracy is the most important aspect of a test kit, and you often get what you pay for in this regard. Some kits are more accurate than others, and you should not necessarily go for the cheapest option as the results may not be optimal. Below we’ve included what to look out for when testing, as well as recommend a few of the best pond water test kits currently available for the most accurate results. If you’ve not used a water test kit before it can be quite confusing what to look out for when checking results. 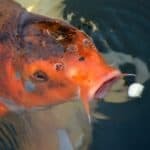 In general, fish stocked ponds are typically more sensitive to certain substances than ponds without fish, so you will need to be more critical of measurements (i.e., ammonia). Below we have listed some important result readings that are commonly included in test kits, including examples of the optimal levels for fish ponds to make reading results easier. For ponds with fish, the optimal ammonia level in water is as close to zero as possible. Ammonia is a potent waste product which can build up quickly in heavily stocked fish ponds. Proper water filtration, a healthy beneficial bacteria population, and a good quality fish feed will all help bring ammonia levels down. Even though the ideal level of ammonia is zero, this is not really achievable in reality. Fish will constantly be excreting ammonia, even more so in warmer weather where their metabolisms are higher and they require more food. There is a direct relationship between ammonia, temperature, and water pH, with rising temperature and pH making ammonia more dangerous to fish. This is a complex scientific area of interest, and beyond the scope of this article. With that said, most water test kits will make this relationship much easier to identity when reading water test results. Most test kits which provide ammonia results will give you a range of ammonia measurements and what they regard as a “safe range”. This is usually color-coded and so long as your water is within this parameter is should be considered safe and healthy for fish keeping. A substance created during the nitrogen cycle where beneficial bacteria break down ammonia. Nitrites, just like ammonia, are harmful to pond fish and the eco-system in high concentrations. Ideal levels in pond water is the same as ammonia at zero, but this is very difficult to achieve in practice. Getting the concentration of nitrites as close to zero as possible is ideal, and having a value slightly above should be considered normal for most ponds. Although pond test kits will differ in values, a maximum acceptable level of nitrite in pond water for fish ponds is around 0.2mg per liter of water. Just like ammonia, certain events can cause spikes in the substance for a short period, so you should not worry too much unless nitrite levels remain higher than this for an extended period of time. Nitrite is created during the natural nitrogen cycle and is a by-product of the breakdown of ammonia. Therefore, the best ways to reduce nitrite levels are to simply reduce overall ammonia and waste levels in the pond. Water pH, or “potential of hydrogen”, is a measurement scale to determine the acidity or basicity of a solution. pH as a scale ranges from 1 to 14, with 7.0 being neutral. Any reading below neutral 7.0 is considered to be acidic, and any reading above 7.0 is considered alkaline. In terms of pond water, a pH range of 6 to 8.5 is generally considered safe for a ponds eco-system. The problem with pH is it has a direct affect on the toxicity of ammonia in water, which is increased hugely as pH increases above neutral 7.0. Due to this, a more ideal pH range for ponds with fish, such as koi, would be from 6.8 to 7.8. This range would provide the least stress to pond fish and the healthiest environment. pH values above 8.5 should be considered dangerous to fish, and will cause large amounts of stress if pH increases further or remains this high. High pH readings are a cause for concern, with the most common culprit being cement or mortar embankments leeching lime into pond water. As well as this, blocks, plant pots, or ornaments next to the pond could also be leeching lime so these need to be checked. Small pH fluctuations should be considered normal, however, so unless the pH of your water is above the acceptable range for more than a few days (or spikes suddenly), you should not worry too much. Another important, but often overlooked, water parameter which directly affects the pH of the pond is the KH value. KH is the measure of dissolved bicarbonate and carbonate ions in pond water which work as buffers, preventing pH dropping too low or changing too suddenly. Low levels of KH will reduce beneficial nitrifying bacteria which break down ammonia, and will also increase the chance of sudden pH swings which are very dangerous to fish. One of the best ways to keep a stable pH level in your pond is to ensure you have a stable KH value. When using a test kit the results for KH may be expressed in PPM (parts per million) or DH (degrees of hardness). If the test result is given in DH and you want to know the PPM value you can multiply the DH value by 17.9 to get the value in PPM. As a general guideline, if the value is above 125 ppm (7 dh) and below 200 ppm (11 dh), you have a good KH range. To reduce KH if your values are high you can simply add more tap water, distilled water, or RO water to the pond. If values are too low, adding sodium bicarbonate and re-testing after a few hours until a value above 125 ppm is achieved is recommended. General hardness, or GH, is a measurement used to show the total amount of dissolved calcium (Ca++) and magnesium (Mg++) in water. Depending on your country and region, you may have naturally soft or hard water coming from your mains supply. Typically in hard water areas ponds will have a higher GH value than in soft water areas, as extra minerals find their way into the pond during water changes. An ideal hardness range for fish ponds would be around 100-150 ppm (mg/L), assuming the hardness is being caused primarily by calcium, as calcium carbonate (limestone). Calcium carbonate is vitally important to maintaining stable alkalinity (the “carbonate” part), as well as supporting a koi bodily functions, such as the regulation of salt within the blood (the “calcium” part). For more information on the topic of general hardness, see our main hardness article here. One of the best pond water test kits for accurate ammonia results is the API Pond Master water kit. This testing kit provides readings for ammonia, PH, nitrite, and also phosphate content in water. Unlike some other tests, this is a liquid based analysis which can help provide more precise measurements if used correctly compared to regularly test strips. Liquid water tests are generally preferred by koi owners, especially for show koi, as getting very accurate ammonia readings is very important for optimal fish health. The test kit comes with 6 small testing bottles for each different substance, including dual tests for both ammonia and phosphate. Included is clear instructions, glass test tubes for mixing, and detailed color charts so you can match up your results easily. One of the most important tests for fish is ammonia, and luckily this water test kit provides very accurate measurements. It also gives a good idea of nitrite and phosphate to a fairly high degree accuracy. The pH test is a “wide range” test, however, so will not have the pin-point results of a dedicated pH tester device. It provides a pH range of 5.0-9.0, displayed in increments of 0.5, so if you’re looking for 0.1/0.001 accuracy, this test may not be suitable. With that said, this pond test kit is one of the easiest to use for a beginner and also provides very good all-round results. Ammonia, Nitrite, and Phosphate are important and results are easy to read, and the wide range pH test should be more than sufficient for most types of ponds. Tests: Ammonia, pH (wide range), Nitrite, and Phosphate. Our product of choice for testing the parameters of general hardness (GH) and carbonate hardness (KH) is the Nutrafin liquid testing kit. Instead of using more common strip tests for evaluating hardness parameters, the nufrafin kit comes in the form of a liquid which allows for a much more accurate measurement of your ponds hardness range. Although intended for use in aquariums, the test will work fine for any amount of water, so is perfectly suitable for ponds and water gardens. Two vials are included with different solutions – one for testing general hardness (GH), and one for carbonate hardness (KH). Along with the vials is a sterile dropper and a tube for mixing the solutions when testing parameters. Unlike strip tests where you compare the resulting color after mixing to a (often) difficult to read color chart, Nutrafin makes things easier by measuring hardness by the number of drops needed to induce a change in color. You simply add a sample of your pond water to the test tube, and then slowly add drops of each solution to the sample water until you see a change in color. Once you notice a change in solution color, it means you have reached your current GH or KH parameter, so you match up the drop count to the information sheet included to get a reading – simple, but very effective! The test is super easy to carry out, and the included plastic lab base allows convenient storage after testing. In total, the kit provides around 10-12 water sample tests depending on your water sample size. When you’ve finished all current solution, Nutrafin provides the option to purchase re-fill vials separately so you don’t need to purchase the entire kit again, which is a nice option to have. If you’re looking for the most accurate possible pH measurement for your pond, an electronic pH tester is the way to go! Unlike regular color-coded water test kits, electronic readings can provide results to a very high degree of accuracy. DrMeters’ industrial pH tester is a good choice for getting super accurate pH readings, with a 0.01 resolution of pH. This means you’ll receive a pH measurement to two decimal placers, making it more accurate than more common 0.1 resolution testers which come with common ‘all-in-one’ kits. The box comes with everything you need to get started, including 8x dime batteries (4 are extras! ), an instruction sheet, calibration mixtures, and the actual pH meter. The meter is a really good build quality, and comes with a nice backlit LED screen for easier use in darker conditions. Before using the meter you will need to calibrate it! Luckily, calibration is a fairly easy process, but needs to be performed accurately for the best results. The product comes with different sachet packages with both a temperature and pH number – these are the mixtures you use to calibrate the device by adding them to distilled water (not tap water!). First, you mix the 6.86 solution into a clean glass with 250ml of distilled water and place the meter inside. Hold the meter still within the solution and wait for a reading to stabilize on the screen. Once the number has stopped moving, start holding down the “CAL” button for a few seconds to calibrate and then release the button. The final reading should be the same as the solution mixture for each test, so in this case it should show 6.86. Clean the end of the meter with distilled water and repeat with the other two solutions, 4.0 and 9.18. Afterwards, it will say “END”, which indicates a complete and successful calibration process! Overall, a very good choice for pond owners looking for the most accurate pH value possible. It does not test for anything other than pH, however, so is best combined with other test kits for a full range of measurements. A fantastic UK pond water test kit which includes all 6 important water tests for garden fish ponds. NT Labs PondLab kit provides results for pH, GH, KH, nitrite, Nitrate, and Ammonia. If you want an all-in-one kit for the essentials without having to purchase separate tests, this is a very good choice. The box comes with multiple test tubes and liquid solutions for easy mixing, and includes charts on the back of the box sleeve to match with your results. Since the results are on the box itself, be careful not to throw the box sleeve away before running all the tests! The box also doubles as a holding environment for the test tubes so there is no need for extra equipment. The results are displayed similar to other color-coded tests, and the pH is displayed as a wide range value (common for these kits), so may not be suitable for pond owners looking for very high pH resolution (0.01/0.001). For most ponds, however, the results provided from this kit should be more than sufficient to provide accurate readings for the safety of your pond water. Ammonia and KH tests are especially useful for ponds with fish, and the tests are easy to conduct and will provide accurate results. Overall, a very useful “all-in-one” pond water test kit which provides measurements for all important water substances. The tests are easy to conduct, instructions are clear, and results are accurate for determining water quality in a pond – highly recommended! Tests: pH (wide range), GH, KH, Nitrite, Nitrate, Ammonia. Another great choice of electronic pH tester with a 0.01 resolution of accuracy. Essentials electronic pH meter is useful for pond owners who require more than just a wide range value for pH results. This device provides pH result accuracy to 2 decimal points, and is incredibly easy to use. Simply add a sample of pond water to a cup, insert the pH meter and stir and wait for a reading. Results usually arrive in under 20 seconds and are displayed on the bright LED screen. The device is very durable and also water resistant, so can be washed easily under water after use. The tester has a lifespan of 1 -3 years, depending on rate of sampling, is designed to remain afloat if you accidently drop it into the pond. It includes a power saver automatic shut off function, and requires 4 AAA batteries to work (not included). The results are fast to display, and are provided to a high degree of accuracy. Recommended for pond owners who would like more accurate pH measurements, but best combined with regular test kits for ammonia and KH which can have an affect on pH. Please add what can be done to correct ph or other water problems that these tests may expose. Under each water quality section here are some links to separate articles which can help improve those parameters. Also, if you search for the parameter you’re wanting to adjust in the search bar on the website you should find a lot of topics related to it which may also be of help. If there is a particular water quality parameter you’d like more information on, such as pH, let me know and I can consider creating a more in-depth article in future!